My very first attempt to make Japanese curry from scratch, it was quite difficult to balance all the taste, but it’s worth!! 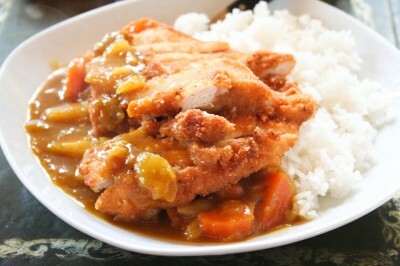 I’ve been dreaming this day when I finally eat Japanese curry again! Errr….it’s been quite long since the last time I ate it, 6 years ago maybe..lol! I always very picky where to eat the Japanese curry, I mean, in Indonesia, you find hundreds of Japanese restaurant, but not all of them have good curry or making them from scratch. I tried curry before with the ready made paste, and to me it was way too artificial. I had taste maybe 2 or 3 really good Japanese curry, but all of them are in Indonesia, and I’m in Cyprus, so there is no way to eat it. So, was searching for quite sometimes now, and I found this website, and decided to give it a try, my very first attempt! The ingredients are very simple, and as usual, I don’t have a lot of things at home, also I have a disorder that I can’t follow an instruction, so the recipe is a bit different. I used natural fig jam (no added sugar) instead of apricot jam. I used tomato ketchup instead of tomato paste, I used ginger powder instead of fresh one (when you try it, use the fresh one). I added some chili powder and I used flour to thicken it rather than corn starch.